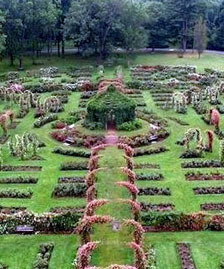 We New Englanders have been fortunate to have had a long and lovely fall season. 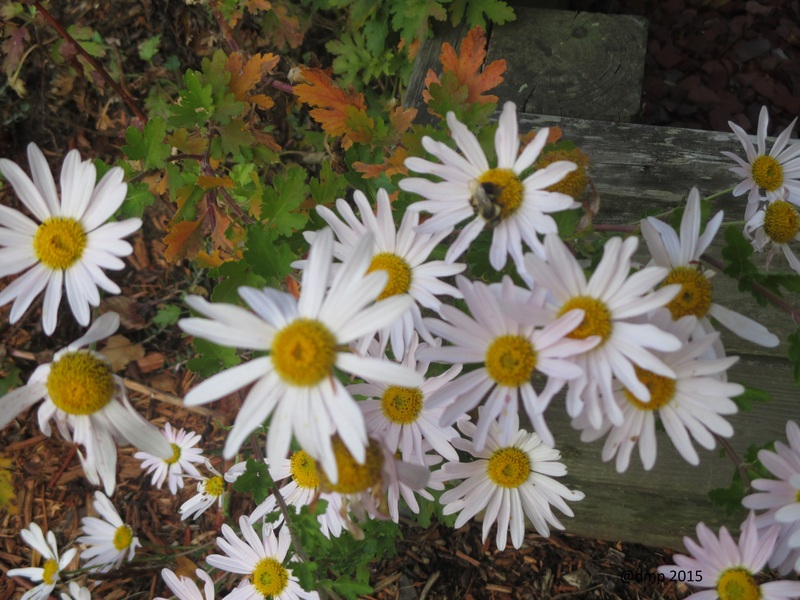 The frost was late, warm temperatures rebounded, leaves were spectacular and late season mums are still going strong – good for pollinators. Even more tender plants continue to bloom in sheltered areas. While there is much admiration for the brilliant yellows, fluorescent oranges and flaming reds covering many trees and shrubs this season, I am more partial to the pinks, burgundies and maroons. The fall reminds me of that aging bottle of red wine – once the bottle is uncorked, the rich, expressive elixir is savored but gone all too soon. The pink blush on the panicled hydrangea reminds me of a pink moscato. 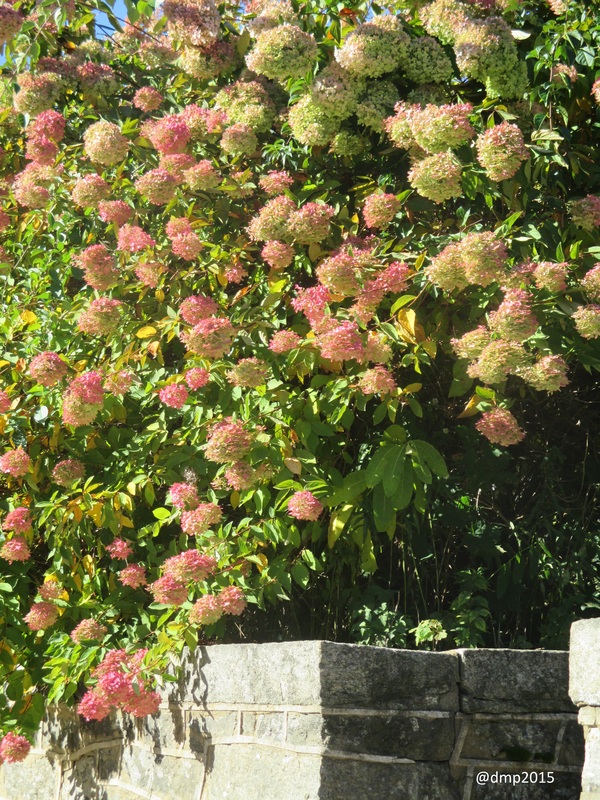 Notice how the delicate pink and cream flower heads soften the hard, grey stone wall. This is a good placement for this plant that often is planted as a lonely specimen but adds more charm when it is worked into a planting or the landscape. 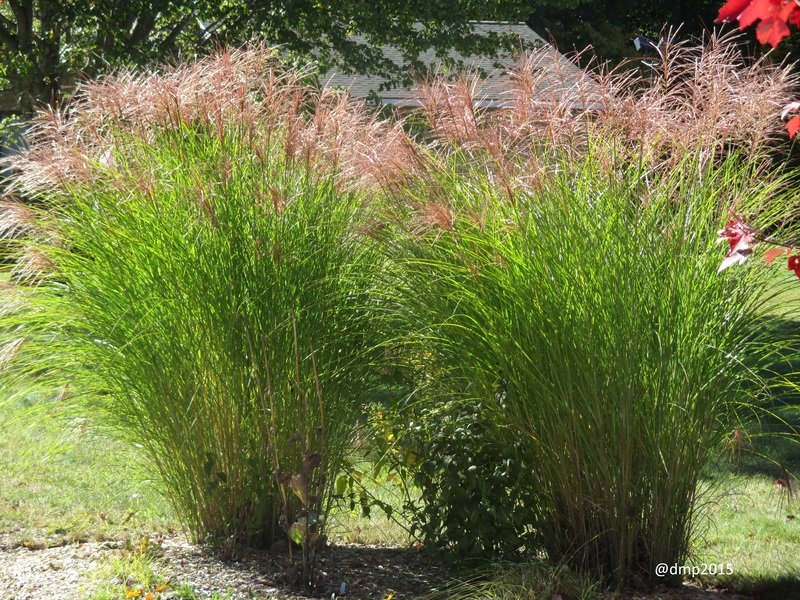 Sparkling pink champagne brings to mind the flower heads of miscanthus ‘Morning Light’. The pale pink, effervescent plumes dance in the wind and are positively radiant when the morning sun drenches them in light. The whispy miscanthus plumes dance in the wind. 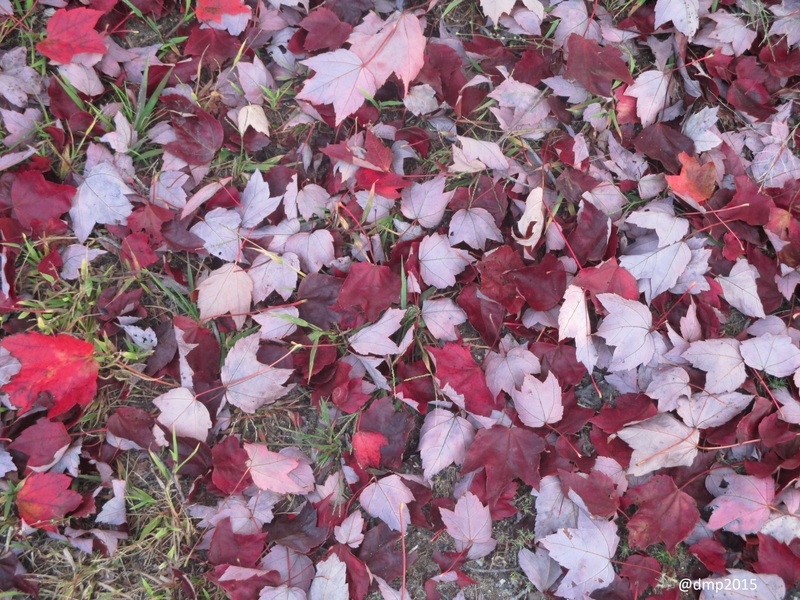 Recently fallen red maple leaves cover the walkways in merlot and burgundy. 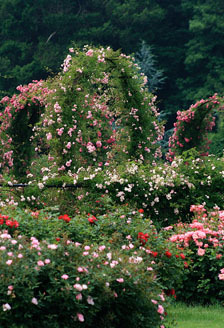 They crunch underfoot and get piled mischievously by the wind in between the branches of shrubs, in newly raked corners and in low-lying areas. Oak leaf hydrangeas take on a reddish hue the color of shiraz. 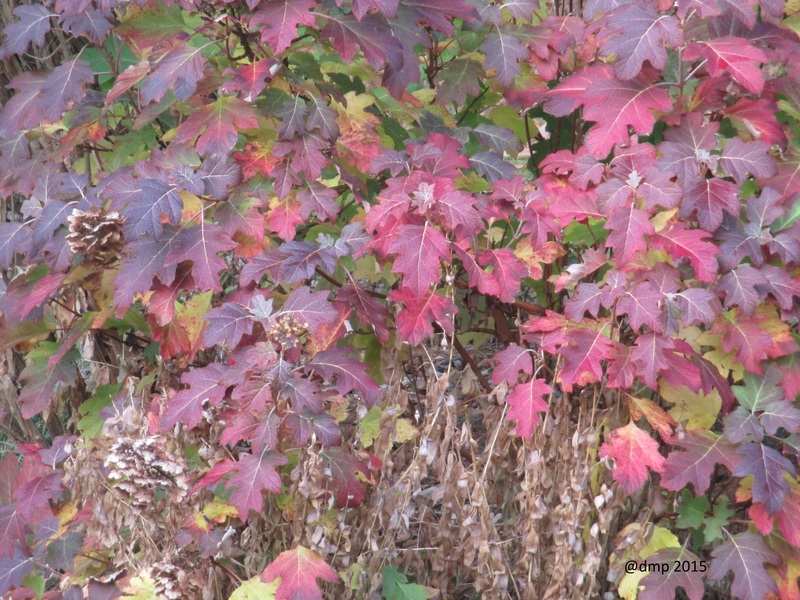 Maple leaves in shades of maroon and silver. Oak leaf hydrangea in splendid fall colors. 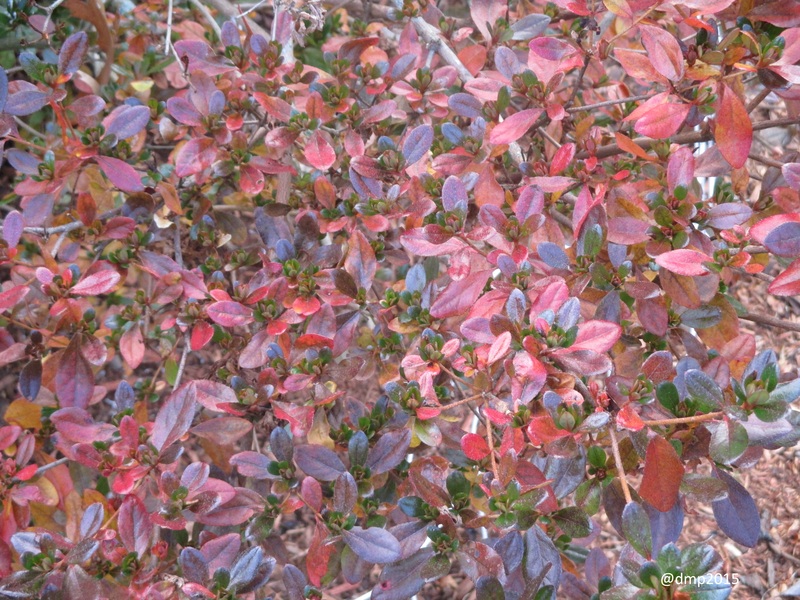 Many azalea species lose their leaves as cold weather approaches. The evergreen ones take on hues of maroon, bronze and rose. I like to use their branches in holiday window boxes and arrangements. 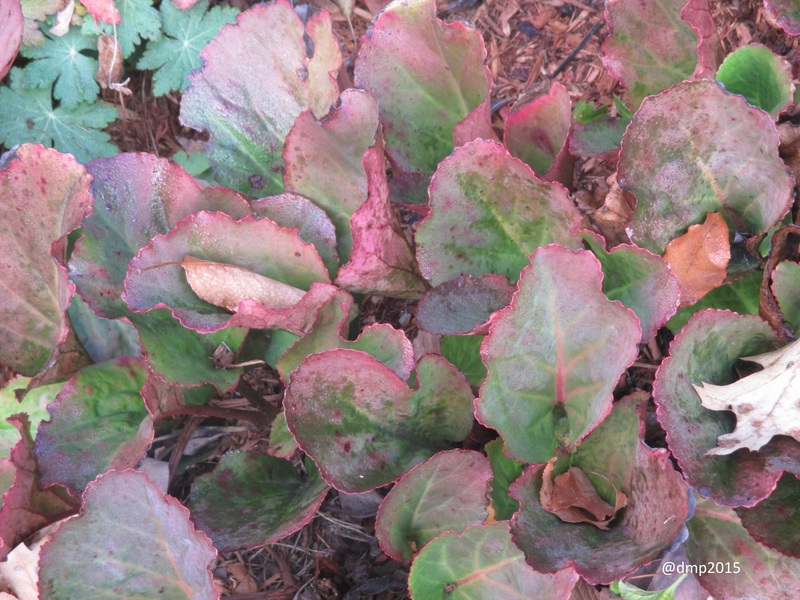 Bergenia leaves hang on all winter tinged with cranberry. Azalea leaves can be used for winter arrangements. 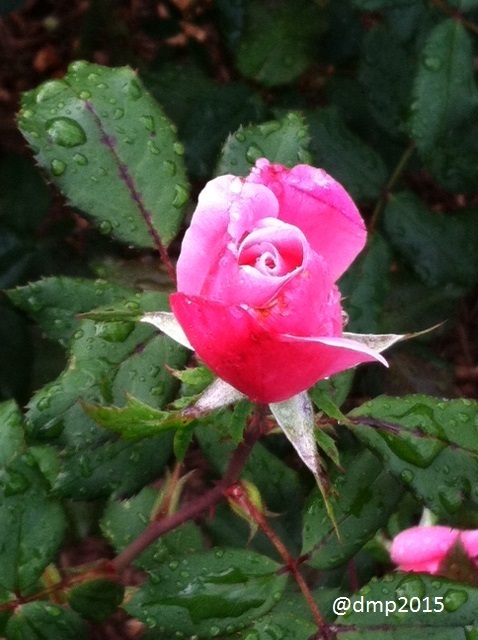 And then, there is the occasional rose. While the rest of the plant kingdom is turning its thoughts to dormancy and the long, cold winter ahead, it is not uncommon to find a softly scented, unfurling rose bud in a more protected area, undaunted by the darkening days and serving as a reminder of the warmer days we’ve left behind.